The pink-bellied side-necked turtle (Emydura subglobosa), also called the red-bellied short-necked turtle, is a freshwater species relatively new to the North American pet trade. As the name suggests, this species has a pink to red belly, with shells in varying shades of beige, gray and brown. It is referred to as a “side-necked” turtle because it pulls its head sideways rather than straight back to retreat into its shell. Native to Australia and New Guinea, this freshwater turtle species can live 30 to 50 years with proper care. In the wild, these turtles feed primarily on crustaceans, mollusks and aquatic insects that share their river habitat. 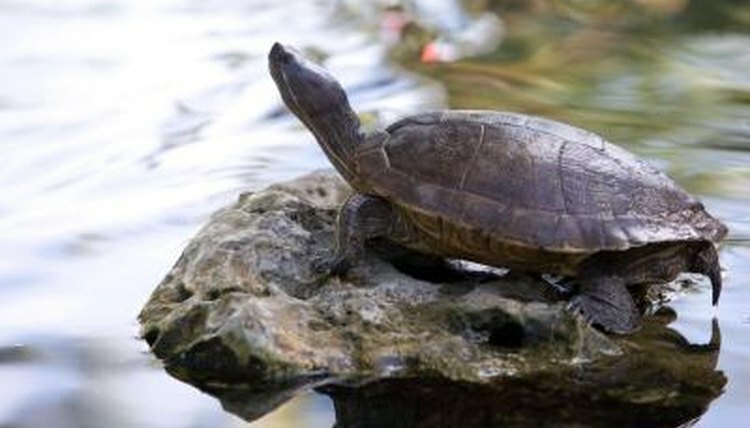 Captive pink-bellied side-necked turtles don’t have overly-specific dietary requirements and eat a variety of plants and animals. They easily adjust to whatever feeding schedule their owner finds convenient, as long as they’re fed approximately every other day. While commercial turtle pellets and cut fish are adequate, pink-bellied side-necked turtles also enjoy a variety of vegetables, worms, chicken and lean beef. These turtles swim fast and are very active, especially in warmer water. They also breed well in captivity. As aquatic turtles, they feel safest in water, coming out rarely. When they do bask, they usually sit on rocks or logs that are partially submerged in the water. With a few exceptions, such as American snapping turtles, they get along well with most other turtle species, making them an easy species to add to an existing pond habitat.